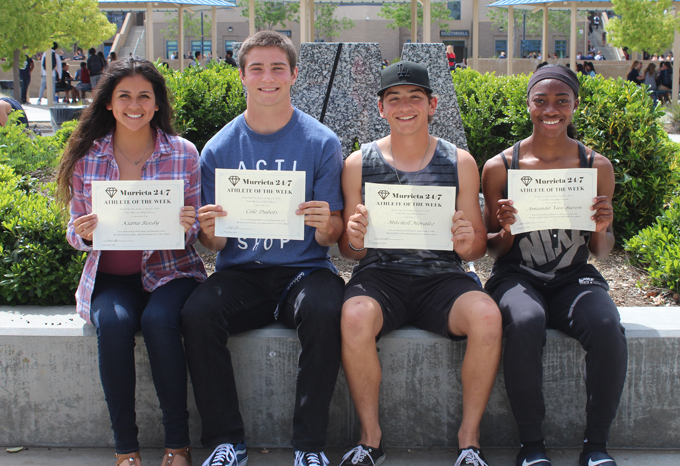 From left: Kiana Reedy, Cole Dubots, Mitchell Moralez, Amanda Van Buren. Junior center fielder and third baseman Mitchell Moralez is hitting .333 with 8 RBIs for the baseball team, which is 11-5 this season. Sprinter Cole Dubots won the 100 meters in 10.63 seconds for the boys track team at the Mt. Carmel Invitational in San Diego on March 26. Amanda Van Buren of the girls track team won the 100 meters in 11.70 seconds and she finished second in the 200 in 23.90 at the same meet. Girls lacrosse player Kiana Reedy is "outstanding in the field," said her coach, Danielle Jackson. The junior defensive midfielder is averaging three goals and three assists per game. "She's a great teammate to her team and she's always on time and ready to work," Jackson said.